It was vital a new garden at Bay Tree Farm reflect the tasteful and sophisticated renovation of its ancient farmhouse. The team at Bestall & Co knew that the design had to be modern, yet sympathetic to the feel of this imposing property. It also had to sit well in its vantage point above the breathtaking scenery beyond. This southwest-facing space was redesigned and rebuilt over three phases. Bestall & Co decided very early on to create a cultured contemporary garden. The team developed clean lines composed of resilient Indian sandstone and York stone, echoing the renewed strength of the buildings. On the other hand, use of cedar cladding and decking evoke the spirit of the surrounding woodlands. 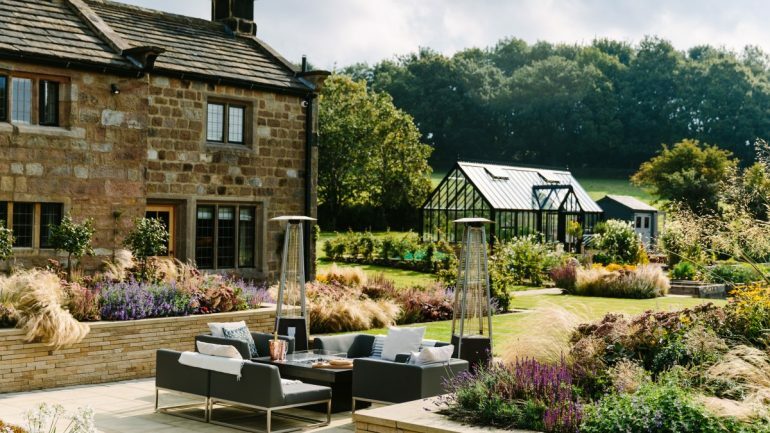 The greys and black of the stylish outdoor furniture, the framework of the Alitex greenhouse and the slate of the spherical James Parker water feature add a hit of modernity. So too does the inclusion of a bronze-effect sculptural piece as a focal point to the southeast of the garden. Much of the planting at Bay Tree Farm varies from softer hues like Nepeta “Walker’s Low” and Hydrangea “Annabelle”, through to much richer colours. Examples of the latter include Hylotelephium “Matrona”, Veronica spicata “Rotfuchs”, Knautia macedonica and Astrantia “Hadspen Blood”. Splashes of vibrancy are found in clumps of Rudbeckia fulgida “Goldsturm” and Helenium “Moerheim Beauty”. The borders closest to the house are underplanted with Narcissus “Thalia” and Allium “Purple Sensation”. In this way, spring interest is increased in that part of the garden most readily seen from indoors at a time of year when biting winds still blow. Ilex “J.C. van Toll” lollipops and Buxus sempervirens balls add essential height and architectural elements. Carpinus betulus hedging around the sunken patio area brings in a touch of formality while Stipa tenuissima helps soften the garden’s straight edges. The movement of wind through the trees continues in the planting of Stipa gigantea in the lower beds. 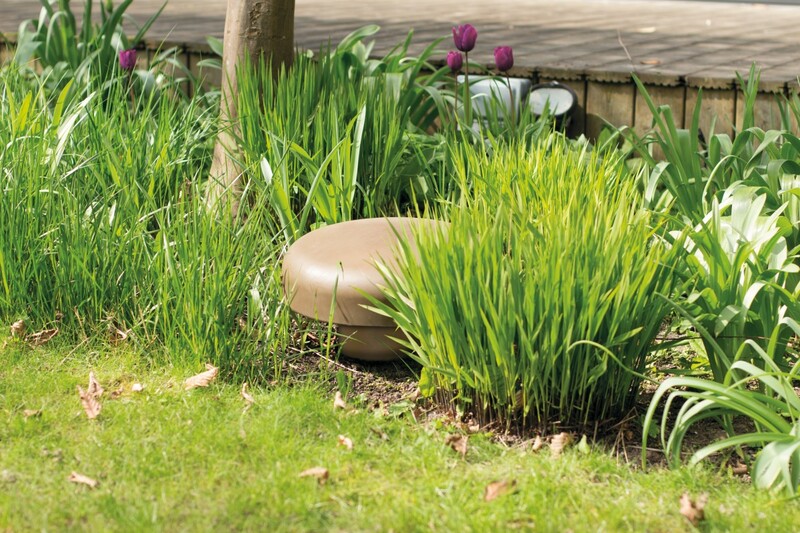 Like the soothing sounds from the water feature, the rustling grasses are an extra sensory element that render the sunken seating area a fantastic spot in which to unwind. A conscious decision was made to lower the level of the seating area in phase one, to avoid impeding views towards and from the house. You receive a warm welcome as you descend to the side of the fire pit, elegant in its simplicity. In a similar vein, the second phase – the pool, hot tub and outdoor kitchen – were strategically positioned for their proximity to the home and an indoor spa and entertaining area. Phase three of the redesign further developed a sense of practicality. The stately greenhouse was erected in this stage. It allows the owners to start off their own produce, which can be hardened off outside in adjacent coldframes. There are raised vegetable beds, a small orchard and an ericaceous patch for blueberry cultivation. Despite its beauty, this remains a functional family garden. With help, it’s become the perfect place to relax, entertain and nourish body and soul.